Mr. Charles Fakrogha, Chief Relationship Officer at Foresight Securities Limited, said that looking at the figures, especially the allocation to capital expenditure at all levels, it was doubtful if the government would achieve the objective of stimulating the economy using the 2018 budget. He, however, advised both the state and federal government to pay more attention to the implantation of the budget, saying that it is key to achieving its goal. He said: “Generally, budgets by government is a proposal that is supposed to give the government focus and direction as to what it is expected to do in a budget year, but looking at the budget and the numbers, one can conclude that you cannot stimulate an economy when you have more of recurrent and the capital expenditure that is supposed to stimulate the economy, you do not have much money for that. “ So, looking at the figures and what is there on ground, it is very discouraging and it will not be enough to stimulate the economy as the government has planned”. “Government must ensure that the little that is budgeted for capital expenditure is judiciously used. And of course, if implementation on the part of government and government agencies is done sincerely, it will go a long way in helping to achieve the objective,” he added. Agreeing with Fakrogha, Mr. Dolapo Ashiru, Managing Director/CEO, Mega Capital Financial Services Limited, said it is doubtful given that implementation of the 2017 capital budget has been very poor with the government achieving barely 40 percent implementation level. Nevertheless, he said, that implementation of the 2018 budget could be a lot better as election year approaches. “First of all, looking at this year, when it comes to capital expenditure, it has been very poor unlike the recurrent expenditure. But for 2018, because we are in election cycle, it is most likely that the government will do better in capital expenditure in the new year. “Ashiru said. So on paper, I think the budget will be enough to stimulate the economy, but the problem is if the government will be able to implement. Regrettably, the government does not have the track record of faithfully implementing the budget”. He stated that government at all levels has to show more discipline in implementing the capital expenditure segment of the budget. 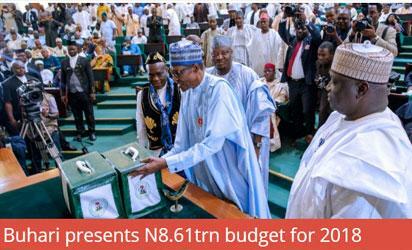 The post Budget 2018: Economist raise doubts about execution appeared first on Vanguard News.